I love a family run joint. You may or may not know, my family is in the business ourselves. Knowing all the blood, sweat and tears that goes behind these types of restaurants makes me appreciate them even more. When we moved to New England, we quickly discovered it is the land of infinite diners. Everywhere you look there is another greasy spoon, and each one seems to be just as delicious as the next. 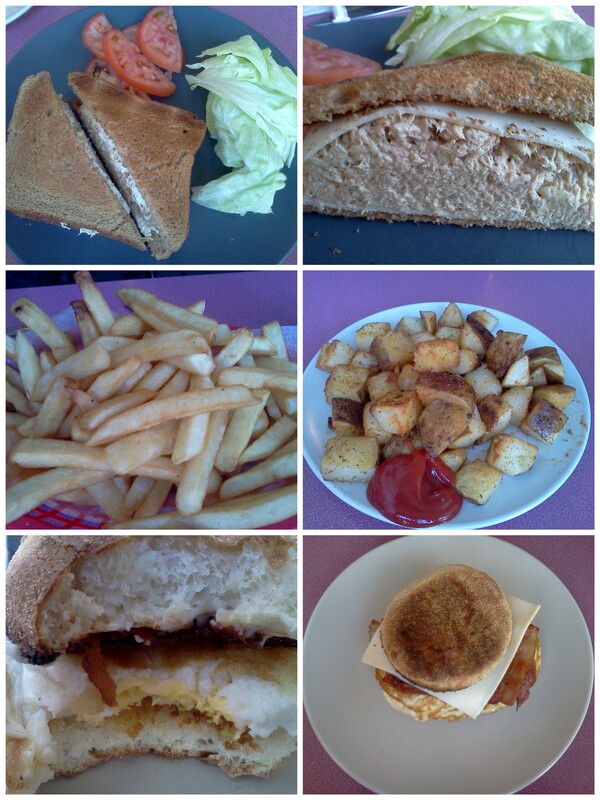 It didn’t take us long to find Crown Cafe in Watertown, since that is our neck of the woods. This breakfast stop changed hands more times than I can remember during our first year here. But it finally landed in the hands of the nicest Armenian family. Any time you would go in the shop, the owner and his son would great you with a smile, and just enough polite conversation that you wouldn’t get irritated. Then they would serve you one of the best cups of coffee in town, and a home cooked meal, all for under $10. Then one day, there was a new family behind the counter! We panicked, questioning the young girl serving us. Was the menu going to change? Would the prices change? How about the portion sizes? And the chicken salad? The chicken salad club is SO delicious it would be an actual crime to change it! But the sweet girl assured us that her family planned to keep EVERYthing the same. They are actually family friends of the old owners, and they understand that the secret to Crown Cafe’s success is consistency. So, we ordered, we over-ate, and we conceded. We were sad to see the old ownership go, but happy that the new owners understand the neighborhood. 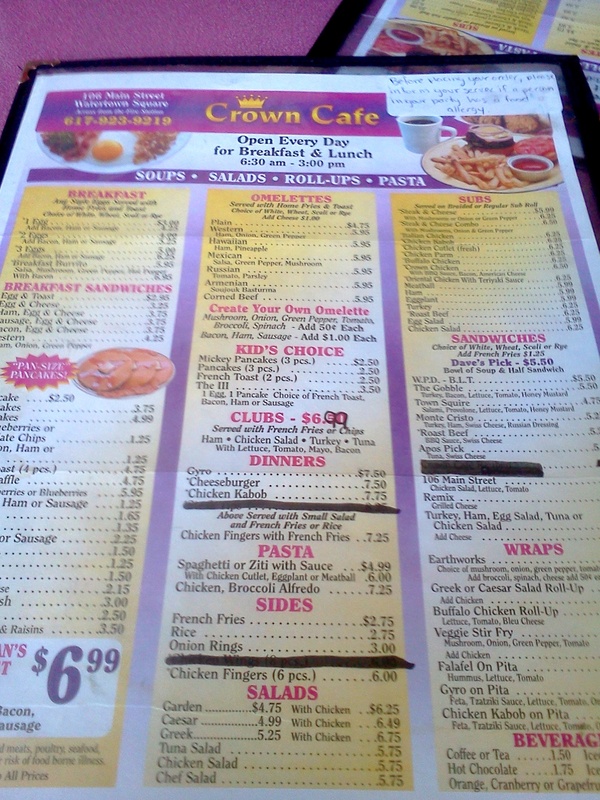 If you are ever in Watertown before 2pm, and looking for a delicious, hot meal for a low price, give Crown Cafe a try. Trust me, it will feel good to support a nice, locally owned establishment! Coffee – It is ALWAYS good! Grilled Chicken Dinner – For under $10 you get a HUGE portion of deliciously marinated and perfectly grilled chicken over rice. This usually is good for 3 meals for me! Honestly, I have never been disappointed with anything I have ordered! What is your favorite neighborhood eating joint? Crown Cafe is located at 106 Main Street, Watertown, MA 02472. They are open for breakfast and lunch and accessible via the Watertown Yard Bus Stop. 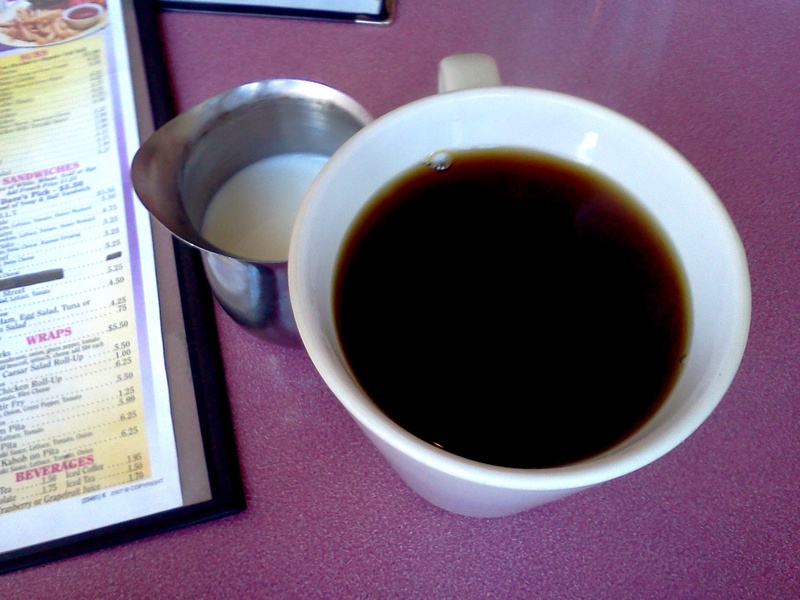 This entry was posted in Reviews and tagged boston, breakfast, coffee, diner, family, family owned, lunch, MA, restaurant, restaurant review, review, watertown by reneeh. Bookmark the permalink. Watertown has quite the selection of breakfast places! I’m partial to Deluxe Town, but have you been to The Spot? I’ve been dying to try it for years. Elizabeth- The Spot is awesome! They make all of their bread on site. The grilled cheese is so amazing and HUGE! But, it is very small, so I don’t always feel like being so squished. But definitely worth the visit! I love places like this! There is a place in my hometown called TD Waffle that was an awesome breakfast joint. It eventually changed ownership and became Vic’s Waffle but I was happy to find that the menu, staff and everything remained the same! ooh! I’ve only been to Town Diner but this looks like a great place. So cool your family has a cafe and wine bar! The Neighborhood Restaurant is right down the street from us and is a great neighborhood spot to grab a filling breakfast!